Do you travel often- for business or for pleasure? The IHRSA Passport Program makes it possible for our members to maintain their healthy habits and enjoy workouts while they travel. 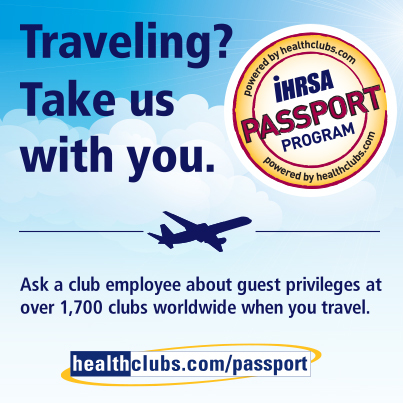 Because Fort Sanders Health and Fitness Center is a member of IHRSA, the International Health Racquet & Sports Clubs Association, and enrolled in their Passport Program, our members have guest privileges to more than 9,750 quality clubs worldwide when they travel. The IHRSA Passport Program provides our members with significantly reduced guest fees- a minimum of 50% savings – when they visit a participating club located at least 50 miles from FSHFC. Active FSHFC members may simply ask our Front Desk or Membership staff for a valid form of Passport ID. Visit www.healthclubs.com/passport to locate a participating club in the area where you will be traveling. Make sure to always call ahead to let the club know you will be visiting. Upon arrival, show the front desk staff your Passport ID, pay the guest fee and you’re in! Passport guests must honor each club’s rules and regulations regarding guest fees, guest hours, visitation frequency, etc. Not all IHRSA clubs choose to participate in the program, but only IHRSA clubs are eligible. Valid Passport identification is only available from your home club, FSHFC. Whether you’re leaving town for business or pleasure, there is an IHRSA Passport club waiting to serve you. For more information, please contact our Membership Team at (865) 531-5049.